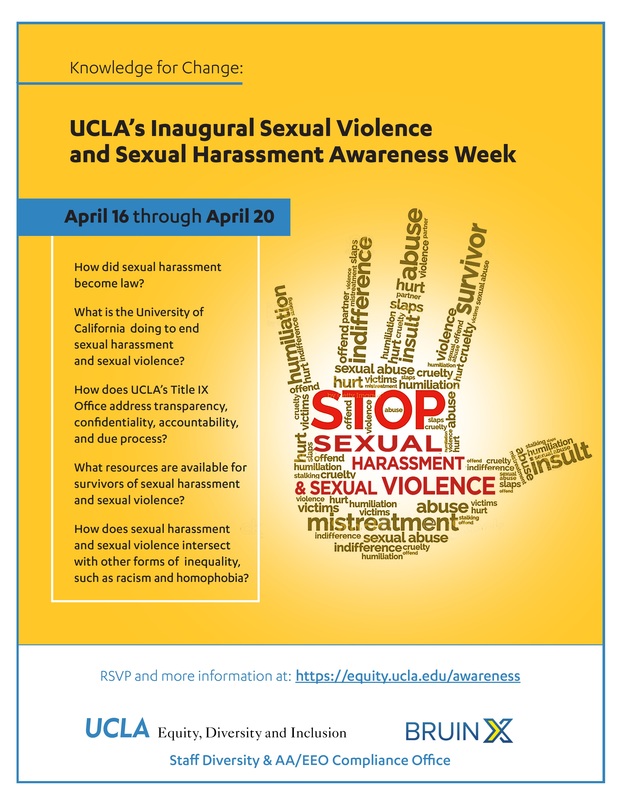 In collaboration with multiple campus partners, UCLA’s Office of Equity, Diversity and Inclusion has organized a week of programming on sexual violence and sexual harassment. To occur from April 16 through April 20, sessions will explore UC-wide efforts to eliminate sexual violence and sexual harassment on our campuses; UCLA’s processes for adjudicating allegations of sexual violence and sexual harassment; and the range of resources at UCLA available to those who have experienced sexual violence and sexual harassment. This five-day schedule will also include discussions on the origins of sexual harassment law; how sexual violence and sexual harassment impact Bruins and the unique vulnerabilities of certain groups, such as LGBTQ members of our community; and the ways in which UCLA’s Title IX Office navigates concerns about accountability, transparency, remediation, and due process. We hope this week of programming enables everyone in the UCLA community, including alumni, community members, and friends of the university, to listen to, reflect on, and express diverse perspectives and opinions about features of social life—sexual violence and sexual harassment—that undermine our longstanding commitment to equity, diversity, and inclusion. We look forward to and welcome your presence and participation. The tentative schedule is below. ➡ View the video-recording of this event. 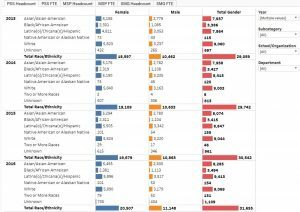 Participants: Panel discussion after the film will include Chair of African American Studies and Associate Professor of Sociology, African American Studies Marcus Hunter and Professor Brenda Stevenson, and Adjunct Professor Funmilola Fagbamila.